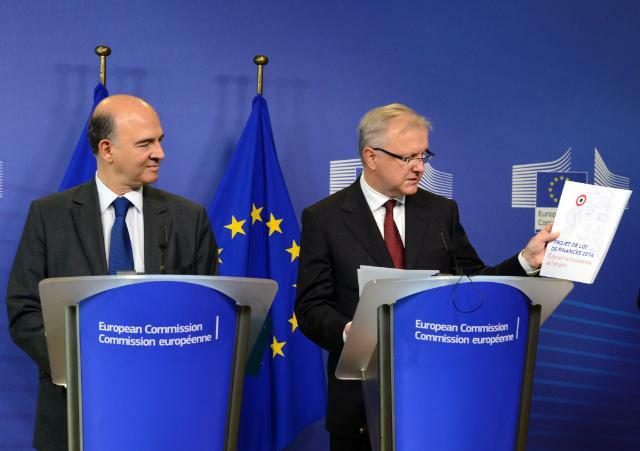 Olli Rehn, Vice-President of the EC in charge of Economic and Monetary Affairs and the Euro, on the right, received Pierre Moscovici, French Minister for Economy and Finances. The latter notably gave to Olli Rehn the “Projet de Loi de Finances 2014 – France, cap sur la croissance et l’emploi”. (EC Audiovisual Services, 26/09/2013). The Economic Sentiment Indicator (ESI), despite a mild rise in September by 1.6 points in the euro area is still below its long-term average (100), and oscillates around the levels of the third quarter of 2010. However if it continuous on its present upwards course, it may soon recover losses of three years. In any case the ESI has been increasing continuously after the end of 2012, with an exception during the first months of 2013. The Indicator is calculated by the Directorate General for Economic and Financial Affairs (DG ECFIN) of the European Commission. It reflects the opinion of the representatives of the industry (manufacturing), the services, retail trade and construction sectors, as well as of consumers. The data for September were released yesterday. In detail the Economic sentiment indicator for this month was found in the EU at 100.6 and in the euro area 96.9 points. Given that the long-term average value of this index is 100, it is obvious that the EU in its entirety has climbed above the long-term average, but the Eurozone is still below that. According to the DG ECFIN, the September mild increase in the euro area resulted from markedly improved confidence across all business sectors, whereby improvements in construction and retail trade were particularly pronounced. “Economic sentiment improved in three of the five largest euro area economies, namely in Spain (+2.5), Italy (+2.5) and France (+1.6). Sentiment in Germany remained broadly unchanged (+0.3), while it worsened somewhat in the Netherlands (-0.9)”. Eurozone’s industry ESI increased only by 1.1 points, a mediocre score, much less than the September average of the entire economy (1.6). The DG ECFIN acknowledges also that it didn’t include in the calculation of industry’s index the worsened assessments about past production. Passing to the services sector, once more this huge part of the European economy, with an above the average increase of 1.9 points this month, set the pace for the over-all ESI. In this way the services covered the mediocre attainment of manufacturing. As for the consumer confidence indicator, which plays an important role in shaping the over-all index, it continued its slow upward trend since December 2012 in euro area. According to the relevant Press release, “The improvement (+0.7) was thanks to more optimistic views on the future general economic situation, unemployment expectations and the future financial situation of households, which more than outweighed consumers’ increased pessimism about their savings over the next 12 months”. Positive consumer mood goes hand by hand with a retail trade confidence substantial increase by an impressive +3.6. Managers in this sector “were particularly more positive about the present business situation”. Impressive assessments were also recorded in construction and the financial services with 4.4 and 6.1 increases respectively. This survey found also an encouraging general trend, observed across all sectors of Eurozone’s economy. It’s about employment plans being revised upwards during September, as managers reported. Last but not least selling price expectations remained stable in industry and retail trade, while increasing in construction and decreasing in services. Consumers’ price expectations for the next 12 months decreased as well, says DG ECFIN. These findings coincide with the European Central Bank’s predictions for subdue inflation pressures in the foreseeable future. In conclusion, if the ESI continues in its current mild upwards trend, it may reach the long-term average of 100 within the year. The last time this indicator was in that position was three years ago during the fall of 2010.